Hearts and minds: Jennifer Lawrence and Josh Hutcherson. Watching the second instalment of the Hunger Games film franchise was a curious experience, more so than the original. I’m not familiar with the Suzanne Collins source novels, so I’m coming into the series free of any expectations. What struck me more than anything this time around was the sheer extent with which the franchise appears to be playing a have-your-cake-and-eat-it-too game with its viewers. It’s a critique of our entertainment structures, of course: the idea of kids forced into televised gladiatorial combat is disturbingly close to what we see on reality television. But there’s thrills and enjoyment to be had in watching our protagonists attempting to survive. I’m feeling generous, so I’ll say this is actually a reminder of how good, compelling stories should be about that immersive experience: about riveting your attention, thematic paradoxes be damned. Stories aren’t uni-directional messages. The good ones have a capacity of altering their shape in whichever way they deem is best for their survival. Often, they’ll latch onto classic predecessors. 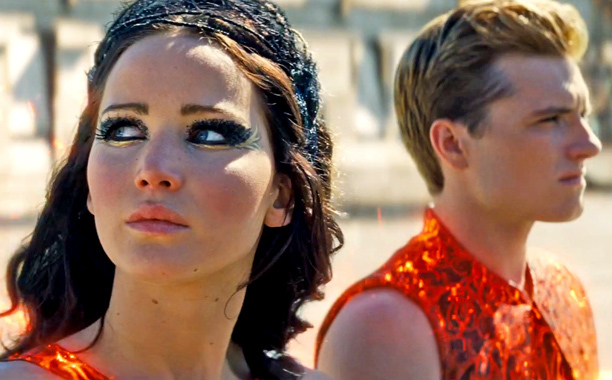 In the case of Catching Fire, Francis Lawrence made a very wise decision in this regard. He channelled one of the most vaunted, enduring ‘middle chapters’ from sci-fi/fantasy: The Empire Strikes Back. Come the end of Catching Fire – mild spoilers ahead – the ‘rebellion’ is dispersed, and our heroine has been physically compromised (see: Luke sans hand). Worse, her partner-in-justice has been captured (see: Carbonite Han Solo). But apart from this narrative puzzle-arrangement, a pervasive darkness is also allowed to settle over the entire film – the feeling that things have to get worse before they can get better. There’s no dictum, no Creativity 101 cliché I like more than ‘Whatever Works’. Zeitgeist-prodding satire married with classic Joseph Campbell/Star Wars riffs definitely works for Catching Fire. I wonder how much of this is deliberate; a strategic narrative positioning for maximum effect. A film adaptation, I suspect, would be more invested in that kind of thing – particularly a film adaptation of this size and financial girth. But from my own experiences of writing fiction, I know that it’s virtually impossible to remember what your original ingredients were. Once the stew starts to simmer, it all tends to coalesce into one colour. Again, only if the story is good. Only if you’re being honest, if you’re letting – or training – yourself to tell the story as consistently as you can, if you’re giving it all the attention it needs. Only if you’re using the right ingredients, at the right time. This entry was tagged Catching Fire, cliche, creative writing, Empire Strikes Back, Hunger Games, Jennifer Lawrence, Joseph Campbell, narrative, satire, sequel, storytelling, Suzanne Collins. Bookmark the permalink.